The Counseling Center at Yorktown Heights is a substance abuse treatment center offering Outpatient and Intensive Outpatient (IOP) programs to the communities of Yorktown and Yorktown Heights, New York, and their neighbors. Disposing of unwanted or expired medications is a great way to reduce drug abuse in your community! After the film, several experts & guest advocates will be on-hand to answer questions about addiction, treatment options, and the recovery process. Update: This event has passed, and was a great success. The next seminar on naloxone training with free Narcan kit will be held at The Counseling Center at Fair lawn, NJ on September 26. This free event will cover how to recognize an opioid overdose, and give step by step instructions on how respond by using naloxone (Narcan™), a medication used to reverse an opioid overdose. Registration is required. Join us at The Counseling Center at Yorktown Heights for the Yorktown Chamber of Commerce Networking Meeting. The Counseling Center at Yorktown Heights is pleased to be hosting the Yorktown Chamber of Commerce Networking meeting! Please join us as we meet with local business leaders for this great networking opportunity. The topic of this conference will be, Emerging Drug Use Trends and Their Impact on the Workplace. The Counseling Center at Yorktown Heights is pleased to host the 2016 Hudson Valley EAPA Chapter Half Day Conference on November 15th from 8:00am to 1:30pm. Yorktown Counseling Center will be attending the 2016 NCADD Conference. Join Tom Roskin, Outreach Coordinator for The Counseling Center at Yorktown Heights on Friday, October 14th at 7:30am at Mulino's at Lake Isle for the 2016 Westchester NCADD Conference on Addictions. With opioid addiction on the rise, we as a community need to prepare and educate ourselves on overdose prevention. This is a free training event that is open to anyone who is or knows someone who is at risk of an opioid overdose. Industry professionals gathered at The Counseling Center at Yorktown Heights. This month's Networking Luncheon attendees included TCC Clinical Director Dadiana Lopez, Outreach Coordinator Tom Roskin, Lisa Crawford from Insight to Recovery, Laura Smith from Westbridge and Counselor James Stuart. Executive Director Rob Anderson will be profiled in Westchester Magazine's upcoming feature "Second Chances". A fundamental rule of substance abuse treatment : anyone willing to accept help for a substance abuse problem is entitled to (another) chance to get started on the road to recovery. There is always hope. Save the date: Tuesday evening, Sept. 8 Please see details in full blog post and flyer. The Counseling Center at Yorktown hosts 6 weeks of the "Spotlight on Recovery" Westchester County support group, presented by Drug Crisis in Our Backyard, a non-profit out of Putnam County. District 26 is holding Al Anon meetings at The Counseling Center at Yorktown Heights. This is the first of a series of Al Anon meetings at the center. The Counseling Center at Yorktown Heights is now a member of the Yorktown Chamber of Commerce. The Counseling Center at Yorktown Heights, a provider of Intensive Outpatient Treatment and Outpatient Substance Abuse Counseling in Westchester County, has been warmly welcomed into the Yorktown Chamber of Commerce. With a different topic chosen each month, the monthly "Community Support & Education Night" helps everyone move forward with recovery within the community. Save the Date! RSVP as soon as you can! The Open House & Networking event has been scheduled for March 11, and will be a fun and informative day of professional networking in Westchester county. The NCADD flyer with registration form for this event can be viewed online. 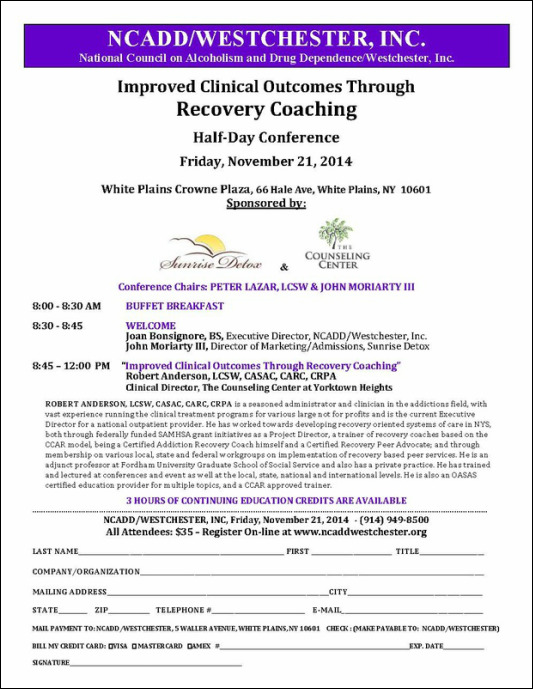 NCADD "Improved Outcomes with Recovery Coaching"
Clinical Director Robert Anderson will keynote a special half-day conference on Recovery Coaching for Westchester chapter of the National Council on Alcoholism and Drug Dependence (NCADD) on Vovember 21, 2014 in White Plains, New York. Read the full post : NCADD "Improved Outcomes with Recovery Coaching"
The Justice Center has graciously agreed to provide the training on-site at our new state-of-the-art Outpatient Treatment Center in Yorktown Heights. We are opening 20 training slots for local governmental officials and treatment providers.